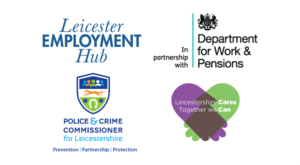 Organised in partnership between Police and Crime Commissioner for Leicestershire, Leicester Employment Hub, Leicestershire Cares and The Department for Work and Pensions, this event is aimed to provide information and support to businesses regarding the employment of ex-offenders. Be able to speak to representatives from Leicester Employment Hub and Leicestershire Care who can support your business to recruit ex-offenders. Receive information about how your business can access up to £2,500 in grant funding to employ an ex-offender from Leicester Employment Hub. Get HR guidance from Leicester City Council and information on the ‘Ban the Box’ initiative. Be given the opportunity to pledge your support to explore further opportunities for employing ex-offenders. Hear case studies from ex-offenders who have been employed through Leicestershire Cares Wire Project. Receive information from organisations who currently employ ex-offenders and the benefits they have experienced through the process. Following the event there will be opportunities for marketing with local media outlets. We are also working as a partnership to develop an online directorate for organisations who support the employment of ex-offenders, where your business will be advertised. In order to help with the organisation of the venue and refreshments please confirm your attendance to engagement@leics.pcc.pnn.gov.uk by Monday 21st January 2019.